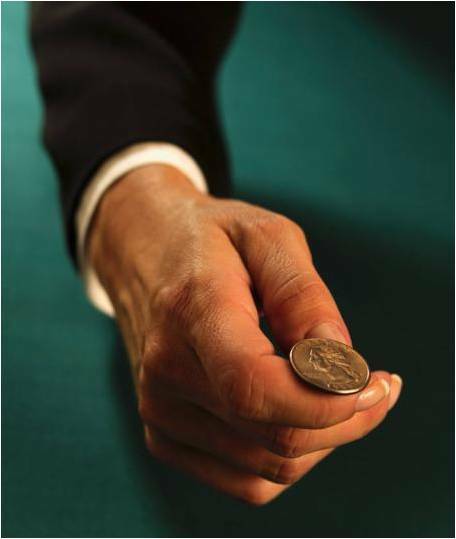 Could RBA coin toss land on hold again? Seems unlikely. All 26 economists surveyed by Bloomberg are calling a cut at the May meeting, taking the cash rate to 2%. Likewise, rates futures are pricing a 79% probability of cut. 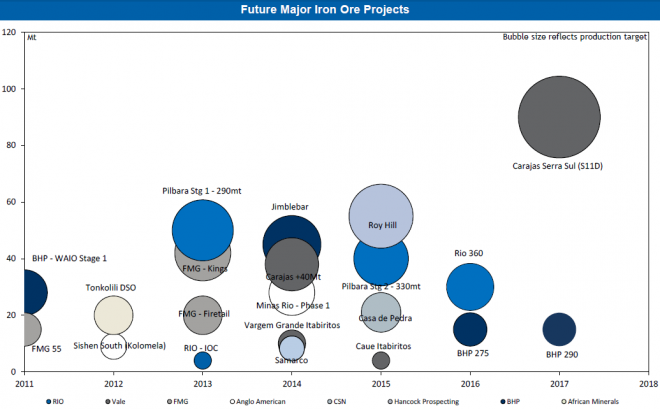 Many found the RBA’s decision not to cut last month quite bemusing, what with the 25% collapse in iron ore prices since the March meeting, the rapidly approaching capex cliff, and the need for an ongoing real devaluation if we’re to see a meaningful revival in non-mining tradables. The reason for holding, however, was clear enough: the RBA is spooked by the investor mortgage Frankenstein it has unleashed, and would rather not cut unless it absolutely has to. My hard-fought call last year that rates would fall before they rose was validated in February, but it bears remembering how heavily I stressed the bipolar nature of Australia’s economy. I believed rates would fall, but only because the structural weakness emanating from the slide in the terms of trade and the capex wind-down was going to overwhelm the cyclical boom in the property space. Following the February cut, the cyclical factors have truly roared, so much so that I am now wondering if the balance is tipping in favour of further reticence on the part of the RBA. Firstly, iron ore has bottomed for now and has put on a good 8% from the (admittedly very low) lows, with Chinese futures having been locked limit up (+4%) for the past two sessions. I don’t anticipate this being much more than a moderate bear market rally, for the simple reason that the market is structurally buggered. A couple of charts from Citi this week illustrate the point. But if iron ore can hold it’s gains and perhaps add another 5-10%, the RBA may well side with cyclical argument for holding monetary settings steady. 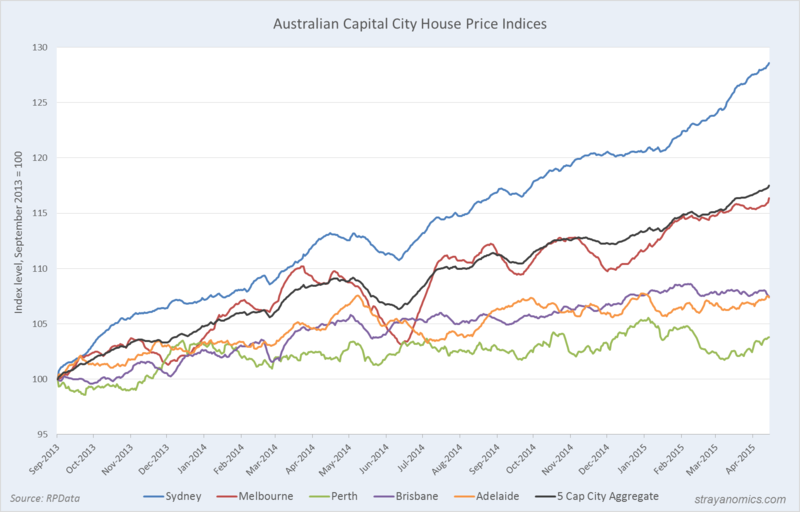 Property markets in Sydney and Melbourne have piled it on since February, and I get the feeling the RBA is especially concerned by just how sensitive activity in this space has proven to the last cut. And perhaps the most important real-time indicator, auction clearances, are also pointing to exceptionally tight markets. Viewed in isolation, this is not an environment a sane central banker could comfortably ease into. But of course it cannot be isolated from the external shock bearing down on the economy, and therein lies the RBA’s mighty quandary. 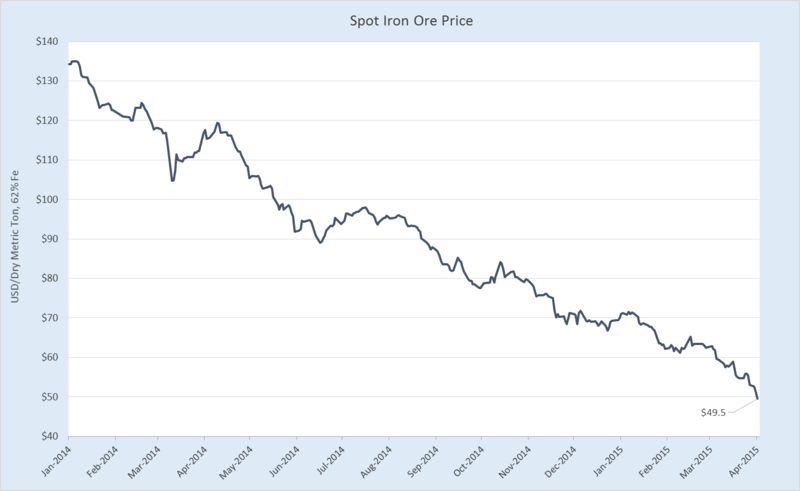 If Oz data remains benign over the next few weeks, and the iron ore price doesn’t crash through the lows before the next meeting, I suspect there’s a better chance of a hold than rates markets are pricing, and much better than economists are forecasting. To the caveats: Firstly, the China national accounts data dump tomorrow morning could be a shocker. If it’s really nasty then the market will have to decide whether to buy on the promise of stimulus, or sell on reality. If nasty data snuffs out the metals rally, the chance of a cut obviously firms. Secondly, I expect the Fed to be dovish again at its meeting at the end of the month, and if this adds to unwanted AUD strength, the RBA’s hand may well be forced by FX markets. This entry was posted in Uncategorized on April 14, 2015 by MJV. Which is more important, a 25% monthly collapse in the price of your main export or a raging housing bubble in your largest city? So stay tuned for next month’s coin toss. This entry was posted in Uncategorized and tagged RBA on April 7, 2015 by MJV. The iron ore crash that so few took seriously is now moving towards its endgame. Australia’s Dog Days have arrived. RIO’s is due to commence production within the next couple months, while Gina’s ore will hit the market in September. And it’s all being dumped upon contracting demand. We are in the grip of a very severe bust indeed. For now, however, the impending collapse of Western Australia’s economy is a boon for NSW and Victoria, as it adds to expectations of further rate cuts. Further cuts, in the absence of tough regulatory disincentives, will toss more kerosene on the Sydney and Melbourne property frenzies. Obviously this cannot go on indefinitely. The WA export juggernaut is the foundation on which the hyper-financialized East Coast economies rest. Currently there’s a torrent of offshore capital flowing into these markets, so overall conditions are fairly robust. But eventually, without a sustainable, internationally-competitive productive base, bubble economies inevitably unravel. I have my own thoughts on when this might happen and what the triggers might be, but really it’s anyone’s guess. Chinese iron ore futures have been crushed again today, currently a whisker away from limit down. This entry was posted in Uncategorized and tagged Australia, Western Australia on April 2, 2015 by MJV. When I started this blog, I was well aware that its dominant theme was to be the stark divergence emerging between key sectors in the Australian economy: On one hand, the terms of trade were crashing, declining resource investment was primed to rip a hole in domestic expenditure, and Australia’s poor international competitiveness was inhibiting the revival of investment in non-resource tradable industries. On the other hand, we had the cyclical upswing centred on the Sydney and Melbourne property sectors, which policymakers hoped would boost consumer spending and employment growth. Whichever sector gained the upper hand in the short-term, I argued, would determine the next move in interest rates. As we know, the army of professional forecasters was wrong; the RBA cut interest rates in February this year. Partially as a result of this, the sectoral divergence in the Australian economy has reached truly deformed levels of late. I say partially for a couple of reason. Firstly, Australia’s external shock has gathered pace quicker than I anticipated (and as anyone who’s read this blog can attest, I’m about as bearish as they come on Australia’s terms of trade outlook!) The relentless slide in iron ore and coal prices (iron ore especially, of course), has hit national income hard and added urgency to the miners’ cost-cutting drive, which directly reduces household income. 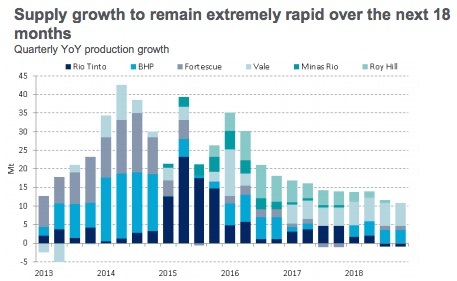 Furthermore, the oil price bust has hammered the economics of Australia’s gold-plated LNG projects, and ushered in a new emphasis on austerity in that sector as well. These trends are exacerbating the divergence in the economy on the structural side, and are obviously unaffected by Australian monetary policy. 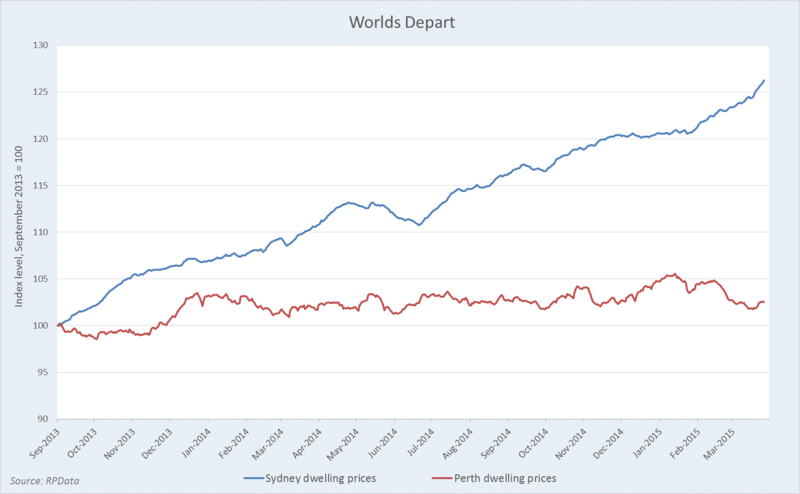 Moving in the other direction with disquieting rapidity is the boom in the East Coast property markets, Sydney’s in particular, which has shifted into a higher gear following the latest stimulus from the RBA. 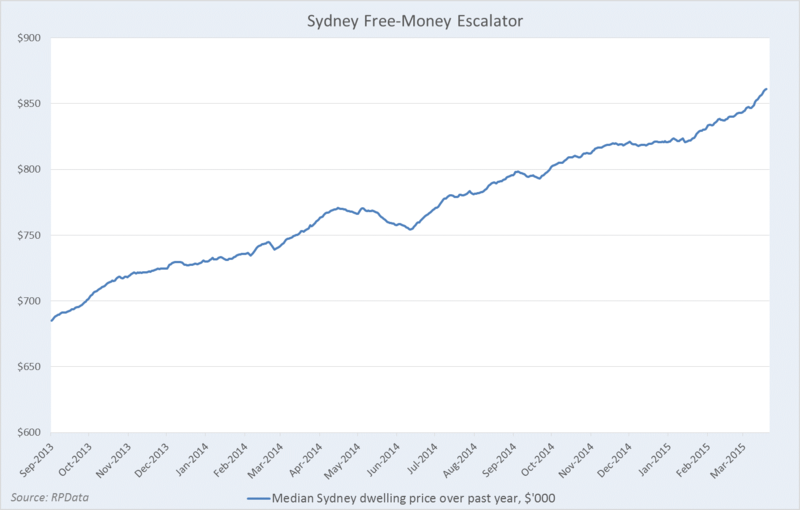 Pick any measure you like; Sydney property is white hot. Auction clearances have soared, investors are increasingly dominating new mortgage issuance, and price growth has rebounded to around 14% from a year earlier. The property boom on the East Coast is undoubtedly being juiced by lower interest rates. But I believe it is incomplete to assign more than partial responsibility to the blunt tool that is the RBA’s cash rate. So interest rates had to fall to reduce the value of the Australian dollar and repair our international competitiveness, but in so doing they’ve stoked a dangerous boom in property prices (which, incidentally, is a drain on productivity and so worsens our international competitiveness). To overcome this apparent paradox, the RBA, in tandem with APRA, should have implemented regulatory controls to stifle speculative mortgage lending, especially when funded by offshore borrowings, before embarking on the latest easing cycle. That they did not, so soon after property bubbles ripped apart numerous developed economies, is a blemish on Australia’s economic policymakers. That they were dismissive of such options well into the boom is a serious indictment. That they finally started talking about macroprudential tools 6 months ago, was something of a relief… And that they still haven’t implemented the mooted controls with any bite, at such an advanced stage of the boom, is frankly an extraordinary failure. Concern about the Sydney property market is shaping as an impediment to another interest rate cut at the Reserve Bank board’s next meeting in April, encouraging it to postpone the decision until May, a week before the federal budget. 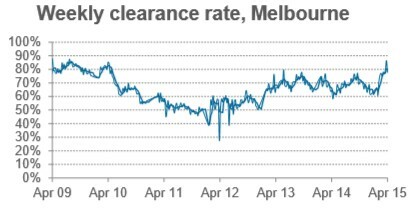 A month of two more with an extra 25bps on the cash rate is not going to rein in the investor frenzy. Only rate hikes or a tough macpru regime has only prospect of success. Does the RBA want to sacrifice the wider productive economy to calm the passions of a property investors, or would be it preferable to slap tough, targeted regulatory impediments on the industry and carry on with the post-boom adjustment of lower rates and a lower Aussie dollar? 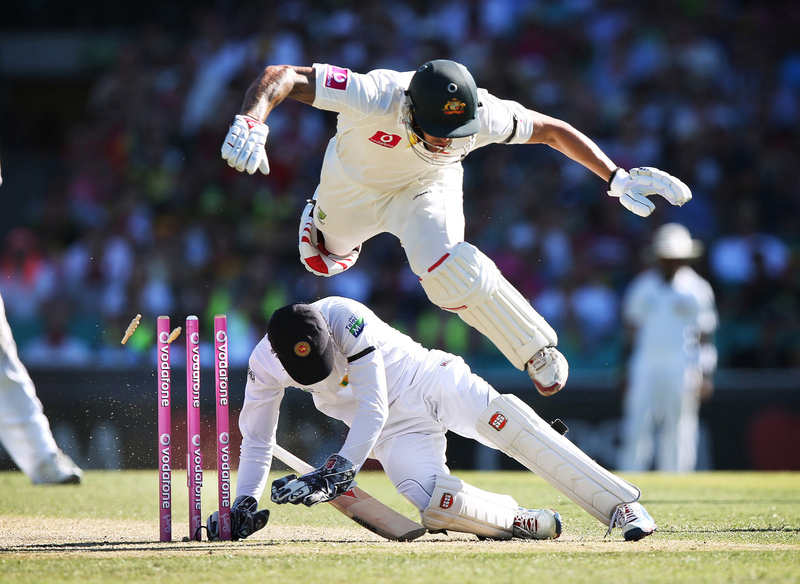 This entry was posted in Uncategorized and tagged Australia, interest rates on March 22, 2015 by MJV. 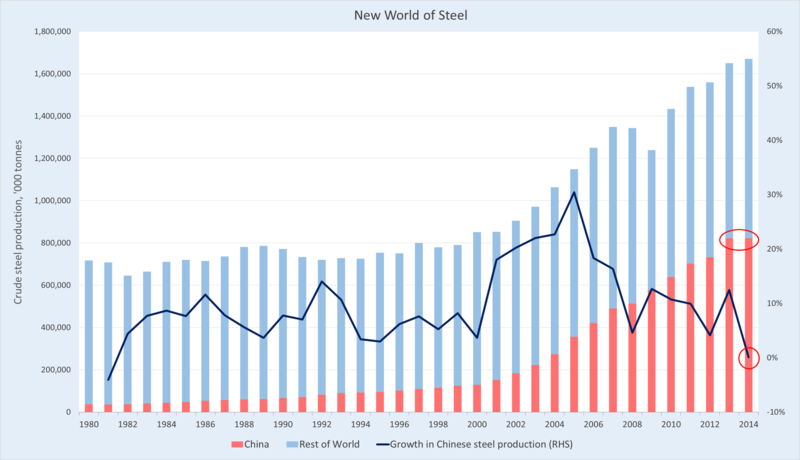 Since the turn of the millennium, as the composition of Chinese demand became increasingly dominated by state-directed investment spending, China has accounted for roughly 85% of the increase in world steel output. In nominal terms, this drove Australia’s iron ore export earnings up 15-fold between 2004 and 2014. This boom has peaked, and indeed, as I pointed out a number of times last year, current levels of steel production in China are only being supported by strong growth in exports; domestic consumption actually declined 3.4% last year, to 738.3 million tonnes. Although the growth in Chinese steel demand has crested (unless the government decides to reverse its policy stance and announces a big stimulus program), I also see little chance of it falling precipitously in the near future. But this lack of growth in output still presents a big challenge. 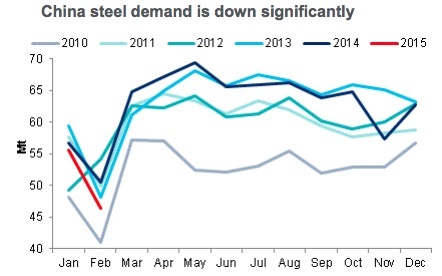 We simply aren’t going to see the billion tonnes of annual Chinese steel demand by the end of the decade that was conventional wisdom until very recently. 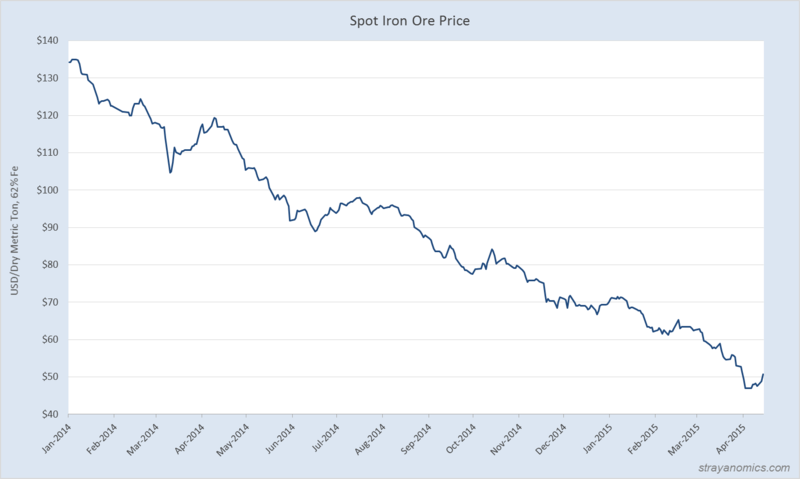 This means that iron ore producers are fighting over a shrinking pie and iron ore prices will continue to slide, I would say for another two years at least. 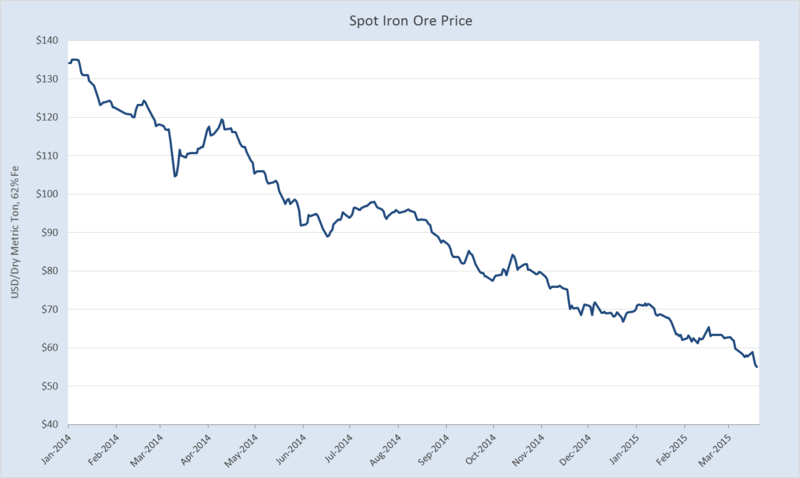 This entry was posted in Uncategorized and tagged China, iron ore, steel prices on February 15, 2015 by MJV. By now it will be clear to anyone with even a passing curiosity in such things that the Strayanomics view on interest rates, more or less its raison d’être last year, was confirmed on Tuesday. The obvious question now is will the RBA cut again? The answer is yes, and perhaps quite soon, depending on employment figures this week. My expectation would be for the RBA to hold at 2% for some time, but next year we’ll see further cuts as the contraction in mining investment bites, iron ore continues to batter national income, and the last hurrah for the housing market draws to a close. It’s going to be very interesting to see where the cash rate finds a floor. I imagine it’ll largely depend on the value of the Aussie dollar. If the dollar remains stubbornly high (because the Fed delays rate hikes, for instance), then the RBA would have room to hack right into the cash rate. If the Aussie dollar starts to fall out of bed (because the iron ore bust goes nuclear or the housing market turns down sharply or both), then the RBA may find itself having to maintain higher rates to protect the value of the dollar. Aside from the RBA’s ‘surprise’ cut, the other news of note this week was of course the leadership fiasco in the ALP. Or the LNP. The Very Serious People over at The Australian are worried: Are any of our prospective captains man enough to reverse the nation’s fortunes? In the accompanying article, Adam Creighton zeros in on the fundamental economic challenge of our time, and misses by a long shot. The principle of spending restraint enshrined in the Prime Minister’s first budget, whatever its political inelegance, may well be only days away from being scrapped. Tuesday’s Liberal Party ballot may be the tipping point that condemns Australia to gradual economic decay. The temptation for Mr Abbott’s challengers within the Liberal Party, just as it has been for Bill Shorten in opposition, will be to ditch Mr Abbott’s rhetoric of fiscal prudence in favour of a vapid, trite — but more electorally appealing — “Go for growth” theme. That will mean, in effect, giving up on spending restraint and endorsing the sort of Keynesian debt and deficits that periodically brings Europe to the brink of financial collapse. Plainly, the source of Australia’s ‘economic decline’ is not the federal budget deficit. The deficit is small and net public debt is miniscule. The only way that the federal deficit will become a problem as we embark on the long descent from our heady boom, is if the huge private debt burden eventually overwhelms consumers, forcing Australia into recession. We would indeed be in a precarious situation then, given that the federal balance sheet is the critical buttress to the bloated banking system. Unfortunately, this is not an idle consideration; the federal government is likely to run into spending constraints far sooner than our low debt profile implies, when stresses start to emerge in the housing and eventually banking sectors. But any discussion of the public balance sheet in isolation is disingenuous; it is the private debt burden, combined with the end of a whooping great (and greatly mismanaged) mining boom, that is the true source of our vulnerability. 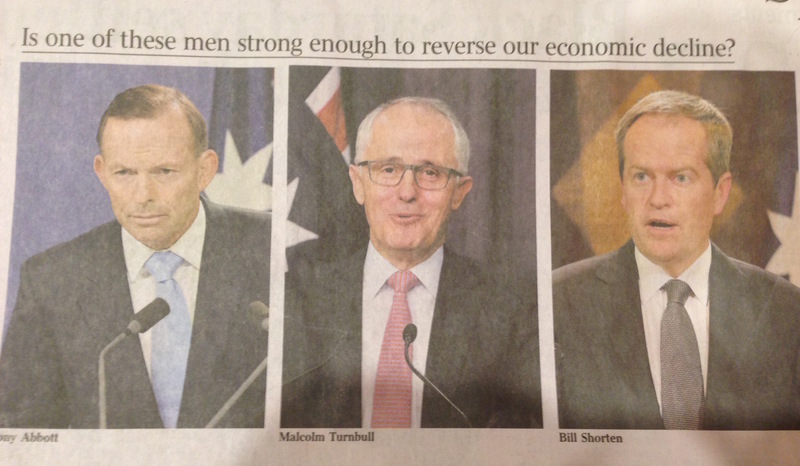 So then, who among our leading men is up to the task of reversing our nation’s economic decline? I am quite confident that very few politicians have an meaningful appreciation of Australia’s current predicament, certainly Abbott is clueless to the point of farce. But I am equally confident that Malcolm Turnbull is one of the few. This entry was posted in Uncategorized on February 8, 2015 by MJV. I’ve recently started in a new job, so the pace of posting here at Strayanomics has slowed markedly from its pre-employment levels. My intention is to keep up with the monthly interest rate posts, the value of which I hope is now beyond doubt, along with sporadic commentary accompanying noteworthy events, when time permits. Prime Minister Shinzo Abe’s ruling coalition won Japan’s general election, according to an NHK exit poll, which also indicated the bloc may maintain its two-thirds majority in the lower house. The coalition of Abe’s Liberal Democratic Party and junior partner Komeito will win between 306 and 341 seats in the 475-seat chamber, public broadcaster NHK projected after voting ended at 8 p.m. That compares with the 325 seats the coalition held before the election. Turnout was set to fall to a record low on a combination of voter apathy and heavy snow in parts of the country. Indeed, very low voter turnout is a big issue for the LDP. Nevertheless, this win has prevented a roadblock being thrown in the path of Abe’s plan to restart nuclear reactors next year, so it seems certain now we’ll see just this. Japan is of course a key buyer of LNG, so a large-scale resumption of idled nuclear reactors means more stress for Australia’s burgeoning yet already beleaguered LNG industry. This entry was posted in Uncategorized and tagged Japan, nuclear reactors, Shinzo Abe on December 14, 2014 by MJV.